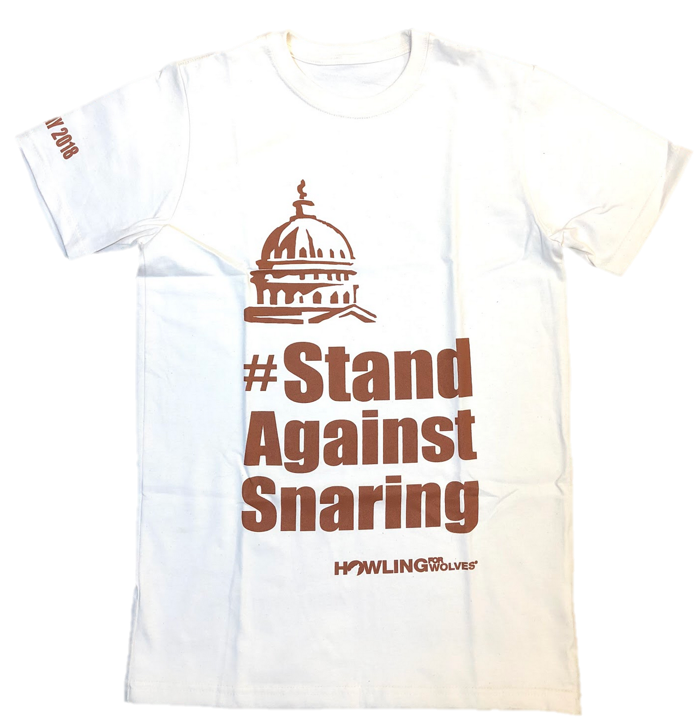 Please donate and wear our Stand Against Snaring T-Shirt. The T-Shirts are made of 100% organic cotton. See sizing information. This striking T-Shirt is a conversation starter; often strangers will ask about the meaning of the T-Shirt. This will give you an opportunity to tell them about wolf issues and the need to join 20+ other US states which have already band together to ban the snare. Each T-Shirt donation is $25. The donation goes toward our 501c4 Howling For Wolves Action Fund which is used to fund our work to change wolf related laws. The donation price includes shipping and handling. To order by mail, download the Order Form.